Bob Anderson, 81, is kind of cat-like. Not in the sense that he has feline features, (he doesn’t, at all), nor in the sense that he sleeps a lot. Nor has he died nine times. But he has had nine lives. Or at least enough adventures to fill the lives of nine, normal, work-forty-hours-a-week-and-vacation-three-weeks-a-year people. In a non-fiction book he self-published in 2010 called ‘The Errant Nomads’, Anderson wrote about “Greenwich Village in the ’50’s, Alaska as a territory, Europe before tourists, Puerto Vallarta as a village, San Francisco in the ’60’s, China just after Mao, Wreck diving in Micronesia, and life in an expatriate colony” – and that’s just one book. Anderson’s two sons, Bob Jr., a fishing boat captain, and Tony, a writer and artist, both live and raise their families in a small town up in Humboldt County. 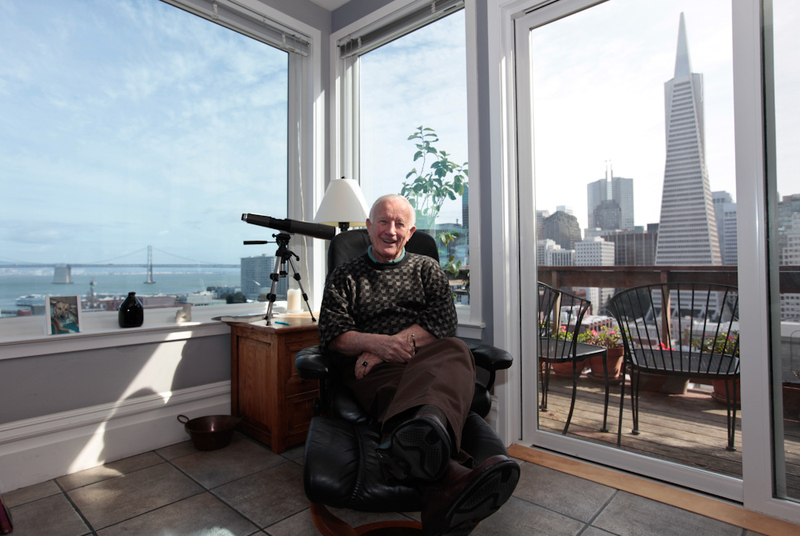 Bob Sr. has lived in Mexico, New York, Washington State, Oregon, and Marin before buying his home in North Beach 28 years ago. He hasn’t moved since. Which is not to say that he’s been stationary. Along with his late wife Jeanne, Anderson criss-crossed the globe numerous times in search of adventure- and most of the time he found it. He has also directed documentaries that touch on subjects only slightly less varied than his own real-live adventures. The view from his home is gorgeous. Two windows, at right-angles from each other, look out on the Bay Bridge and the Transamerica Building, respectively. Anderson acknowledges the view in passing, admitting that it was the reason he and Jeanne decided to buy the building all those years ago, even though $240,000 seemed, at the time, far out of his budget. Many of Anderson’s neighbors have moved in the last ten or more years, thanks to the dramatic rise in their homes’ value. The money allowed his neighbors, many of them Italians who had lived in the area since birth, to move to Marin, and other less urban areas. The view may be fantastic, but there’s another reason Anderson hasn’t moved in the intervening years like so many others. North Beach is “extremely neighborly, it’s very live-and-let-live, [and] it allows a lot of pretty loose living,” said Anderson. For someone who has always lived life on his own terms, this may be the highest compliment Anderson could give. 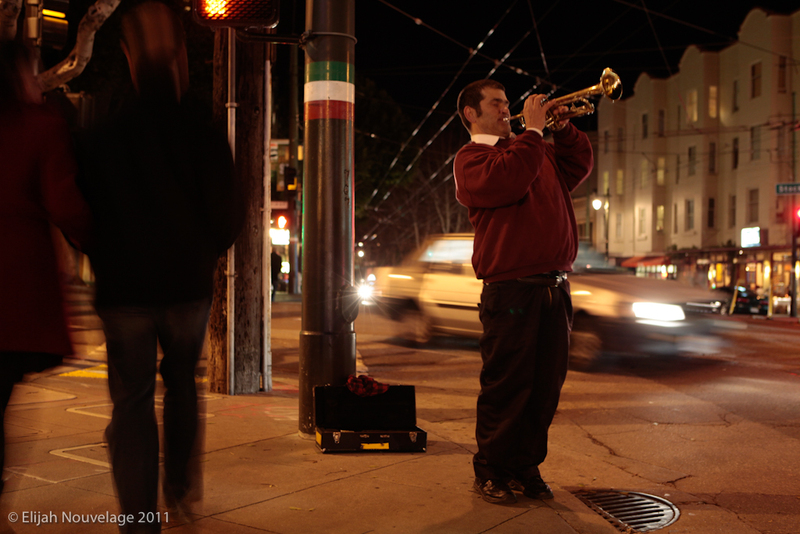 Danny Bobbi plays his trumpet for tips at the corner of Columbus and Green in San Francisco's North Beach. Renato and his son walk up Green street to their home on Castle St.
A man walks across Green street before dusk. A woman stops to look inside Z Cioccolato in San Francisco’s North Beach. A waiter takes the order of patrons at Calzones in North Beach.